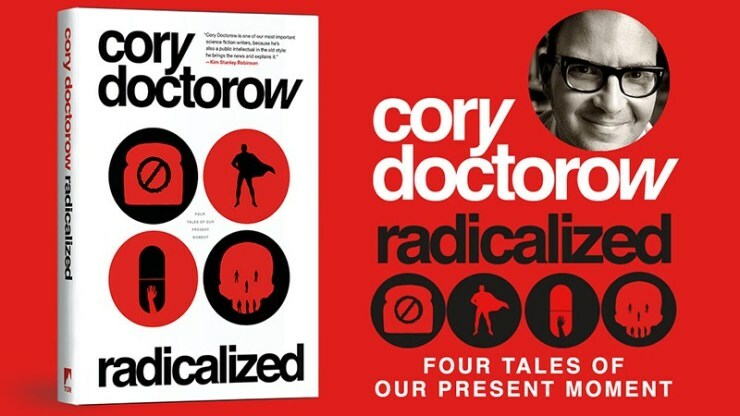 Radicalized is my next science fiction book, out on March 18 from Tor Books: it contains four novellas about the hope and misery of our moment, from refugees resisting life in an automated IoT hell to health care executives being targeted by suicide bombers who have been traumatized by watching their loved ones die after being denied care. Tor Books is sending me on tour with the book in the US and Canada and I hope you can make it to one of my stops! I'll be doing more travel with the book to places like Berlin, Halifax and Toronto later in the year -- check my upcoming appearances page for more.